A view from the FP to the west of Oxwich Castle . The remains of a 16th century fortified manor house . Much of the house that survives was built by Rice Mansel (1487-1559) . The Castle was arranged around an enclosed courtyard entered through a mock military gateway with a Coat of Arms , the ruined Hall is behind , dovecot to the north . 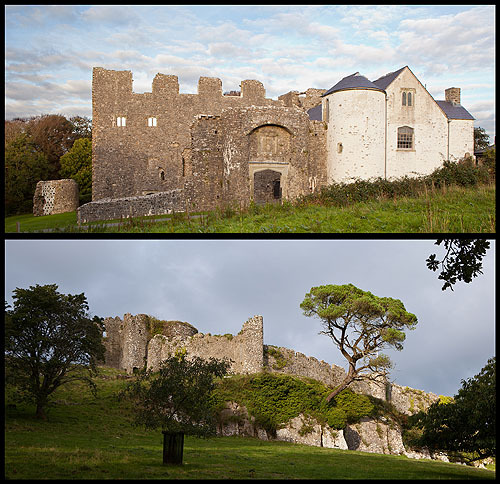 In the Care of CADW - open : April-October. A view from the FP to the south west of Penrice Castle , the largest castle on the Gower .The earliest surviving remains are from the mid 13C. A dovecote is against the south-east curtain wall. The ruined Castle , on private land , overlooks it's successor , a Georgian mansion , built 1773-7 of Bath stone . A landscaped dingle runs down to Oxwich Bay. Car Park - near Millwood , A Foot Path runs through the Parkland. .